Here is a NC Times article about how the Stage 8 made it to North County. Will Tour of CA return? Mattson and Bettin said strong community participation and avoiding any significant problems will probably be key factors in whether race officials return to Escondido next winter. "There are no guarantees they will be back," said Mattson, explaining that some cities have been abandoned since the race was founded four years ago. "My goal is to do everything possible to get them back." Mattson is the main reason the race will be here in the first place. She said tour officials decided last spring that they wanted to expand into San Diego, but they were unsure where. When Mattson got a request for proposals that was sent to nearly every chamber of commerce and visitors organization in the county, she immediately began brainstorming and eventually landed an exclusive contract for the local stage of the race. 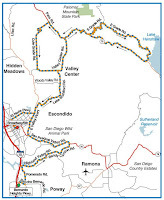 "I knew Escondido and Rancho Bernardo had both been hit hard by the (October 2007) wildfires, so I thought they could use the exposure the most," Mattson said. Tour officials were also attracted to using Palomar Mountain, which will include the highest point ever featured in the Amgen Tour of California event. But Mattson said the race will only return if it is embraced by local businesses and residents. "We need to show them our community flair," Mattson said.